Bacon and Brussels Sprouts are a classic ingredient combination. 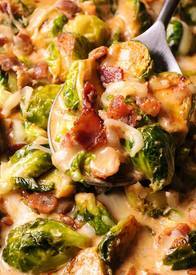 That makes this Creamy Brussels Sprouts with Bacon and Mozzarella recipe from Whats In The Pan so irresistible. The best part is that it takes less than 30 minutes to make this flavorful dish! To make each serving even more irresistible, melt some mozzarella cheese over the creamy goodness of Brussels sprouts and Bacon! Just a little bit of cheese and a sprinkling of salt and seasonings can make any vegetable a bit tastier!